As an affiliate of Trips for Kids, we provide the means for the youth of Sanford and Springvale to experience transformative cycling experiences, including underserved youth. Using the Mousam Way and Rail Trail, local youth can ride in quiet wooded areas minutes from downtown Sanford. Our partners, including the Junior High Bike Club and Sanford Parks and Rec. aim to build self-esteem, inspire healthy lifestyles and instill environmental values. The Nasson Bike Center is one of the youth programs of the Nasson Community Center, founded on the campus of the former Nasson College to provide residents of Sanford and Springvale a unique indoor space for athletics, theater, youth programs, and other community needs. Trips for Kids Nasson is fiscally-sponsored by the Nasson Community Center, and is an affiliate chapter of Trips for Kids, a national 501c3 nonprofit youth development and education umbrella organization. Trips for Kids’ mission is to give every kid in every community the opportunity to know the joy of riding a bike and the freedom to explore the natural world on two wheels. We would not be able to give deserving youth transformative cycling experiences without the generous support of our major sponsors. We are proud to be working in partnership with these supportive businesses and individuals. Join us in saying thank you by patronizing these businesses whenever possible. 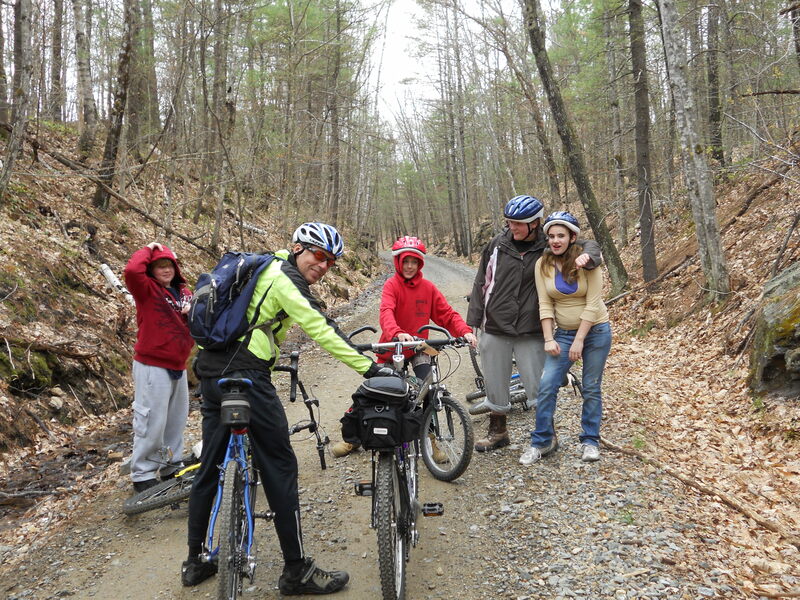 Trips for Kids-Nasson riders on a trail cleanup ride on the Sanford Rail Trail. Behind the Nasson Community Center is a wealth of trails, including a rail trail on the bed of the former Portland and Rochester Railroad, dual-track woods trails and some especially constructed mountain bike trails built by local enthusiasts. The Trips for Kids Nasson chapter supports weekly mountain bike rides from spring through to the fall. My 13 year old son has out grown his bike. He said that there is a problem with the gears. Do you take bikes to fix up for other children. The bike has always been stored indoors when not in use and is in very good condition. We do take donated bikes, and really appreciate bikes stored indoors. Dropping it off while we are open (Tuesday Wednesday Thursday from 2-5) is best. If not we can make other arrangements. Thanks for thinking of us.